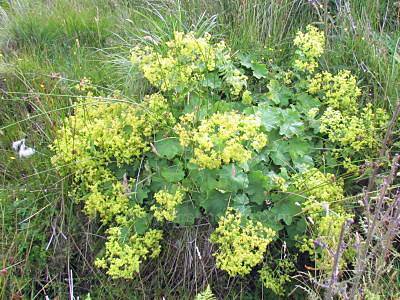 More than 200 microspecies of Alchemilla vulgaris are known to exist in Europe. These perennial wildflowers, members of the rose family, are sometimes grown in gardens - mainly for their leaves, which collect sparkling water droplets. The distinctively corrugated and lobed (5 to 11 lobes with the upper leaves having fewer) kidney-shaped to semicircular leaves of Alchemilla make identification to genus level fairly straightforward. The yellowish-green flowers form clusters. Each individual flower is typically 3mm in diameter, with no true petals but a four-lobed epicalyx, four sepals and usually four but sometimes five stamens. Alchemilla vulgaris is widespread and common throughout Britain and Ireland; it is also found throughout mainland Europe. This plant is also recorded as occurring in Greenland. Lady's Mantle is commonly seen in unimproved or lightly fertilised grassland, on roadside verges and banks, in chalk downland and on mountain slopes. 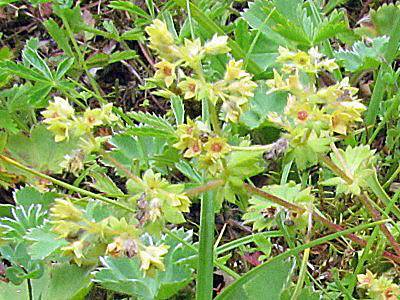 In Britain and Ireland the tiny flowers of Alchemilla vulgaris can be seen from June through to September. Alchemilla mollis, a rather larger species but otherwise very similar, is quite a common garden escape that sometimes appears in hedgerows and on unkempt grassland. Lady's Mantle, which contains salicylic acid, has sedative properties and has been used to alleviate cramps and menstruation pains. 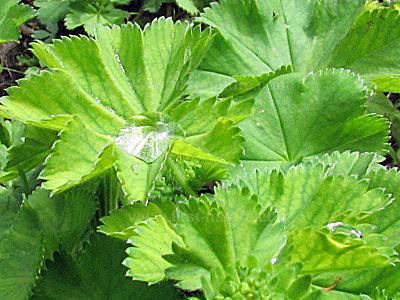 Alchemilla, the genus name, denotes a plant valued for its use in alchemy. The specific epithet vulgaris means common. The Lady's Mantle specimens shown on this page were photographed in Scotland and in Slovenia during June.